Antonio Conte says he deserves patience at Chelsea after last season’s “miracle” Premier League title win. The Blues could only finish 10th in 2015-16 as Leicester won a fairytale title, before Chelsea succeeded the Foxes as champions in Conte’s first season in charge last term. Leicester’s title-winning boss Claudio Ranieri was sacked as the Foxes flirted with relegation last season, while Jose Mourinho was fired just seven months after leading Chelsea to the trophy in 2014-15. But Conte does not fear the same fate, although fourth-placed Chelsea have slipped nine points behind leaders Manchester City in the title race and suffered a 3-0 Champions League defeat at Roma in midweek. “I have to stay with my fingers crossed,” said Conte with a smile, ahead of Sunday’s crucial Premier League clash with Manchester United. “Honestly, I think I earned my time here with the win of last season. “I don’t like to ask for time, I like to tell the truth. “The situation is very clear – my task is to work and to put all myself for this club. “Then, if it’s enough? OK. If it’s not enough? OK. The same. I will continue to live. “If we think I click my fingers and we are ready to fight, it’s not simple. Last season happened. A miracle. 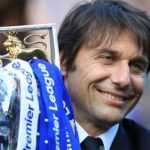 Conte says he has explained to owner Roman Abramovich and the Chelsea hierarchy that he is overhauling a squad which has lost some pivotal performers over the last couple of seasons. “We must be ready to do something special,” said Conte. “But we must be realistic and to understand that we are building. We are creating a foundation. “It’s important to have the patience and then to have the time to do this. “I understand that it’s not for all to have patience – I have not a lot of patience, honestly.